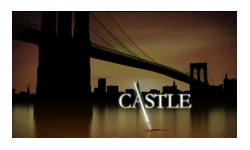 Castle always feels a little like summer viewing, like it should be hidden away on a random small channel (like it is in the UK where it premiers on Alibi). It just doesn’t feel like it’s big enough to air on a major network in the US, the humour is geeky and subtle, the characters deep but not cliché, the whole tone of the thing is far closer to cable summer shows like White Collar and Leverage. But it isn’t hidden, it’s prime-time on ABC, and holds its own in the ratings, coming out 30th overall this year squeezed between Bones at 29 and Grey’s Anatomy at 31. Not too shabby. I, and I suspect many others, would never really have given the show a second glance if not for the fact that it stars Firefly’s Nathan Fillion. Network executives (and the world as a whole) owe Joss Whedon such a debt of thanks for finding this guy and giving him a chance to prove that he’s leading man material, he’s one of those actors that just beams out of the screen. He’s absolutely superb as the eponymous Castle, a completely charming scoundrel who would be utterly frustrating if not for the fact the writers gave him the gift of a ditzy mother and an overly smart teenage daughter who allow him to show the vulnerability that he doesn’t let the rest of the world see. The strength of the premise of course is to pair this irresistible force with someone who is completely uncharmed by him. Becket started out as rigid and hard, but by season 3 she has softened considerably. She’s a bit more friendly, a bit more willing to trust and treat her colleagues as her team and Castle as her partner. That’s not to say she’s not still exasperated by Castle and driven to solve her cases, it’s just all a little less highly strung. Unfortunately, the ongoing arc that winds its way through the season was a bit of a letdown. While it gave some more meaty material, it just didn’t quite sit right. The day to day plots are an entertaining collection of random cases, but they’re played more for humour than for empathy. The victims die in entertaining ways (explosive decompression, a Houdini water tank drowning), or participate in a specific obscure element of society (beauty queens, steampunk fans); it’s not that people don’t grieve their losses, but it feels more superficial. This isn’t a show about the lives that are devastated by crime (the victims, the families AND the perpetrators). Think Bones, not Criminal Minds. But the arc storyline about Becket being haunted by her mother’s death and desperate to solve the case just didn’t quite fit in that model. Particularly once it turned into a conspiracy theory and police overstepping their powers. The big reveal at the end felt particularly weird, it really didn’t fit with the easy-going comedy leanings of the rest of the show. But, I do love it. It’s so easy and entertaining to watch. I sat down to watch an episode over lunch one Saturday and lost the whole afternoon watching about 6 episodes in a row. I find the show so entertaining I’m even willing to overlook the frustrations of the will-they-won’t-they relationship that isn’t quite as annoying as it is on Bones, but comes close sometimes. Nathan Fillion is utterly wonderful and this part is perfect for him, a scoundrel with a heart of absolute gold. Becket is formidable, a hard and determined exterior with a centre of mush. Even the sidekicks Ryan and Esposito seemed to be having more fun and turning into an entertaining double act in their own rights. Other than the rather out of place arc storyline, it was a great season and I’m looking forward to the next one.